Fundamentals of European Union Direct Tax, a new book by Dr. Felix Lessambo, has been released by RoseDog Books. Dr. Felix Lessambo is an adjunct associate professor at St. Johns University (The Peter J. Tobin School of Business), where he teaches International Taxation, Individual Tax Planning, and Financial Reporting: Evaluation and Analysis. He also teaches International Finance, Financial Markets & Institutions, and Corporate of Mergers & Acquisitions at the King Graduate School of Business (Monroe College). Prior to his St. Johns appointment, Dr. Lessambo taught International Tax, European Union Tax, and Corporate Tax at the University of Kinshasa (DRC). He specializes in the taxation of international transactions, transfer pricing, E.U. laws, and international finance. He is the author of Taxation of International Business Transactions and several leading articles in international tax law reviews. It is particularly in this area of E.U. direct taxation regime that Dr. Lessambo has been the most challenging. He foresaw what others were not willing to see, to hear, or to acknowledge. Dr. Lessambo is the first scholar to argue against the incompatibility of the French Controlled Foreign Corporation (CFC), the French transfer pricing provision (Article 57), the French thin-capitalization rules (Article 212), the French taxation regime of artists (Article 155A), and the Luxembourg Securitization Law, with respect to both the E.U. laws and the OECD treaty. Ten years earlier, in 1999, ahead of his time, Dr. Lessambo came out, for the first time, according to Professor Bernard Castagnede, with the opinion that the sole way to crack down the use of preferred tax regimes is to broaden the scope of the exchange of information among tax and financial authorities. The G-20 Summit in London has adopted the opinion in the midst of the world financial crisis (2009). He lectured with the European American Tax Institute (EATI) and other business organizations. He lives in New York and serves on the boards of various Christian organizations. 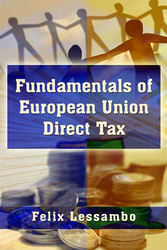 Fundamentals of European Union Direct Tax is a 232-page paperback with a retail price of $ 21.00. The ISBN is 978-1-4349-9951-1. It was published by RoseDog Books of Pittsburgh, Pennsylvania. For more information or to request a review copy, please visit our virtual pressroom at http://www.rosedog.com/pressroom or our online bookstore at http://www.rosedogbookstore.com.